First, the advertisement. I will make a longer presentation at Droidcon London 2009 about Dalvik bytecode in general, using Dedexer examples. This will be a longer version of my previous, short presentation (also in podcast). If central London is convenient for you, please, come. Otherwise I will share the presentation after the event. Much better, isn't it? See you at Droidcon and I will explain how to interpret the code fragment above. Somebody contacted me by LinkedIn whether I would write a review about this book from Addison-Wesley. Why not, replied I, if I get the book to read and it is understood that I am not a professional reviewer. I got the book, read it and here are my subjective impressions. Gee, there are SO MANY THINGS in Android - that was the lingering feeling after having read the book. Because the authors' strong intention is not to make compromises. They methodically go through every feature of the Android API, including 1.5 features. Have you heard about AppWidgets before? Or LiveFolders? I admit that I have not but now I know about them because the book mentioned it. 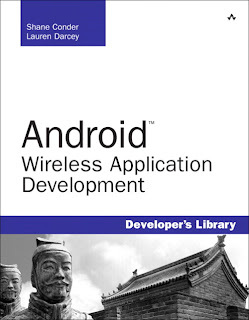 It is best to handle this book as an inventory of Android features and as such, it is very valuable. Such an inventory takes 573 pages, as of version 1.5. I wonder what that number will be in 3 years time.